Rice is a tricky ingredient .You need a short-grain variety – not long-grain, that absorbs liquid easily. Spanish bomba is the best choice,Italian risotto or Japanese sushi rice are also suitable. 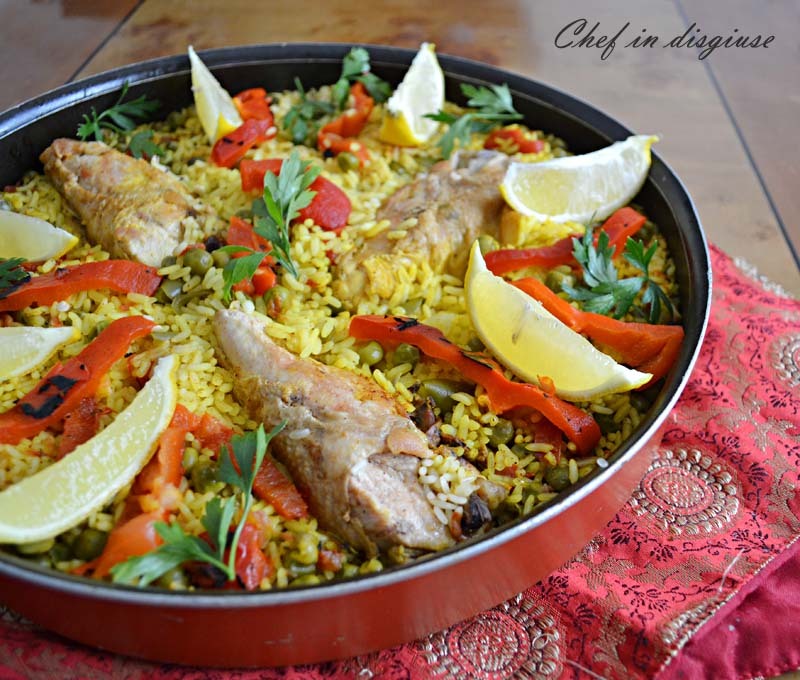 Ideally Paella is cooked in a paella pan (but you can use any wide pan with a thin base) . The idea is to allow the liquid to cook off quickly and evenly. Ideally that pan would be set over a wood fire, to give the dish a delicious whiff of smoke, but a gas ring will do. You can stir paella up to the point of adding the rice. After that, stirring is absolutely forbidden,because you’re aiming for a tender, but not creamy result. Besides, the brown, crisp layer that forms on the bottom of a well-cooked paella, the socarrat, is a highly prized delicacy. The recipe I am making today is some what adapted from this one, I did leave out a couple of the beans I could not find and I added roasted red pepper to add a hint of smoky flavor to the dish. The finished paella really reminded me of Kabseh (the middle eastern spiced rice dish)because there are some of the same flavor players here but the herbs and the lemon juice added at the end are what set the paella apart. I am happy to report that we all enjoyed it and the kids even had the left overs the next day. Thank you Inma for a wonderful challenge and for finally getting to cross paella off my list. Heat a paella pan over medium-high heat, and coat with olive oil. Add the chicken, cook until nicely browned then move the chicken to the sides of the pan. Add the tomato,peas, and pepper strips, paprika and mix well. Add the water to the pan, bring to a boil. Simmer for about 1 hour to make a nice broth. The goal is to make a rich tasting broth that will soak into the rice to make it delicious. Add the rice, stir to combine then reduce heat to low, and simmer until all of the liquid has been absorbed, about 20 minutes. If you do not use par boiled rice, in a separate pan you have to fry a little bit your rice with olive oil in order to seal the grain. If you do not have saffron you can use a little bit of paprika, the flavor is going to be a little bit different and the color of the rice a little less yellow but it works out fine. Adding some lemon drops at the end of boiling helps to separate the rice. 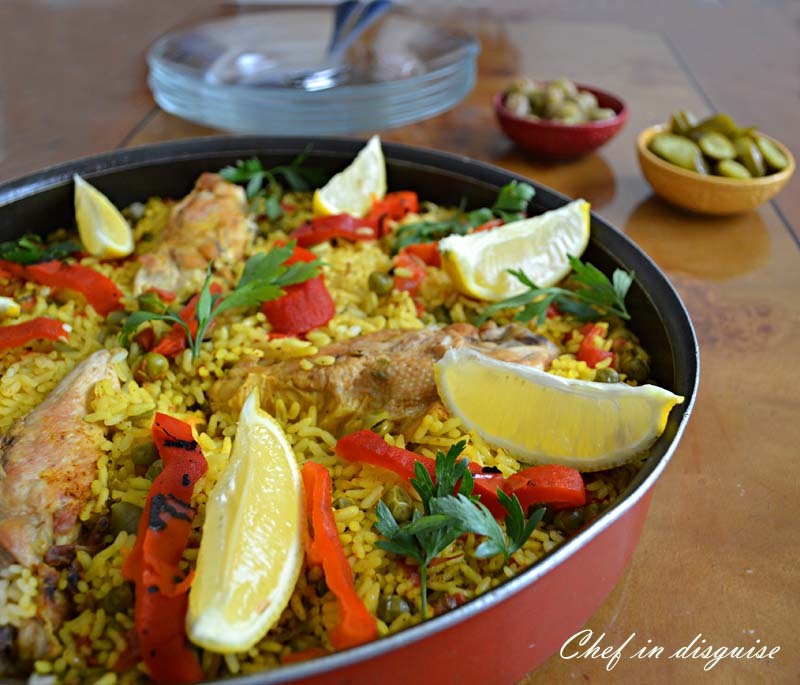 Posted in Chicken, Daring cooks, Rice and tagged authentic paella, can I cook paella without a paella pan?, Chicken paella, daring cooks, dinner, food, how to make paella, paella paella, paella recipe, what type of rice to use in paella. Bookmark the permalink. Wow!! That is such an interesting and appetizing dish. I am hungry!!!! I LOVE Paella and have devised all sorts of ways to make it (as you indicate in your post) I am so lucky to have a wonderful Mideastern Market in a city near me and can always count on them for the most luscious saffron and other spices. I love to make paella with Spanish chorizo (sometimes hard to find around here) and mussels and the chicken. It is such a magical dish and for days the house smells wonderful. Thank you for sharing this dish with your readers. Making paella is really an art and takes the courage and discipline of a true chef. I congratulate you on your beautiful accomplishment! You have inspired me to make some and teach my customers this art. Your paella looks so good! It’s one of my favorite dishes, but I shy away from making it, mainly because I’m not confident in terms of preparing shellfish, but I really should make it with just chicken sometime, like you did, because it’s much simpler but still so delicious that way– and you still get the crispy browned layer of rice! Thanks for your paella-making tips! We ate Paella all the way through our trip around Spain and we thrived on it. I have made it a few times but it is never quite as good as what I tasted there. I think the pan is quite important for getting it right. I sometimes put off making paella because it can be time-consuming. You make it look so easy–and so pretty. Thanks for posting this! Paella is great. I’ve made it before, but it’s been so long ago I forget which recipe I used and exactly what I put in it! This looks wonderful. Chicken always goes well in a paella, and you have a really attractive mix of veggies. Good stuff – thanks. I’ve always wanted to try paella…I always thought it was a seafood dish…good to know it can be done with chicken too! I must have read dozens of paella recipes thru’ the years with few of the ‘grand masters’ agreeing to details 😉 ! Yours looks lovely, am sure tasted great and that surely is what matters!! Must admit I love mine with heaps of seafood not always easy to get close to home either!! Have a great weekend 🙂 ! 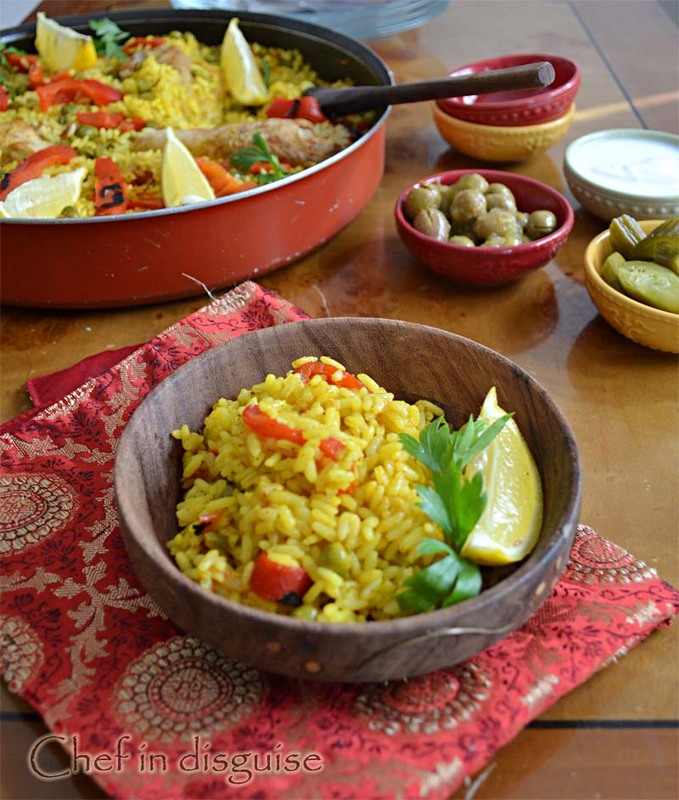 I love paella, one of my favorites (and yes, saffron!). You did a fantastic job! I love paella – pure comfort food! When I saw the picture of your paella on FB, I immediately had to read your post and check the recipe, as I am looking for a good paella recipe for weeks now! Sawsan, I am in love with your presentation, your photos are so tempting (well, they always are ;)) that despite of me having breakfast just 20 minutes ago, my stomach is rumbling….I am so bookmarking this recipe, this will be our lunch for Sunday!! Very lovely! Such a bright and cheery dish. My Paella was absolutely not authentic, but still tasty 🙂 It did make me sad that I was missing the crunchy rice on the bottom. Once again you rose to the challenge beautifully! I have Paella on my list of foods to try while we are in Spain on Tuesday, of course Barcelona Is not where it originated, but I’m sure we’ll find something. The paella I make always has Chrorizo, shrimp, chicken legs and mussels! I make it similar to a friend from Spain! I’ll have to make it again when we return, we still have a lot of saffron from Morocco! As I love eating rice based dishes so I use variety of rice in my cooking. This is a lovely dish to try. oh my goodness this looks scrumptious! It’s always been on my “to cook” list too. I’ve put it off because I don’t have a paella pan. It turns out you can make it in a large skillet. I didn’t worry too much about being authentic. I just added what I like — shrimp, clams and calamari. Yours looks wonderful! Your version sounds delicious and I can tell from your clicks that it must be – Kteer Tayeb. Love paella, yours look gorgeous Congratulations on your success and crossing paella off your list. I posted photos of deer on my post today for your kids. Great looking as usual Sawsan! Beautifully done and with great photos! Your Paella turned out so pretty. I had such a great time with this challenge as well, and when I got to the socarrat I did not want to share any with my husband. 🙂 Will be waiting to see what you do on the next challenges! Thanks for sharing. Yum! I’d love to have that now. THIS IS PAELLA OF ALICANTE. That’s a gorgeous looking paella. I don’t own a paella pan but I’m going to give this recipe a try nonetheless. Wow you cooked that paella perfectly! Just beautiful and so full of amazing flavors and colors. I just can’t get over how perfect this dish looks. It belongs on the cover of Bon Appetit! Enjoy your kiddos Sawsan (which I KNOW you do). Lately, I am feeling very nostalgic for those “little” years. How old are they? Mine are now 14 and 17 and the seventeen-year-old turns 18 in a couple of weeks. I am feeling weird, happy but weird about the whole thing. Your paella is beautiful. I’ve always wanted to make this at home. Paellla is indeed intimidating! You did an outstanding job, and the photos are simply AMAZING! I made paella once with a Spanish student from our lab and her Mom, but they made pretty much everything and I just looked.. I should have taken notes, silly me. They gave me a small paella pan which I should put to good use, under your inspiration! paella is something me and my husband just love dearly. it combines our love for seafood (we always do a seafood version) and rice all in one. A step up indeed from jambalaya! I just love your version with the spics and all. 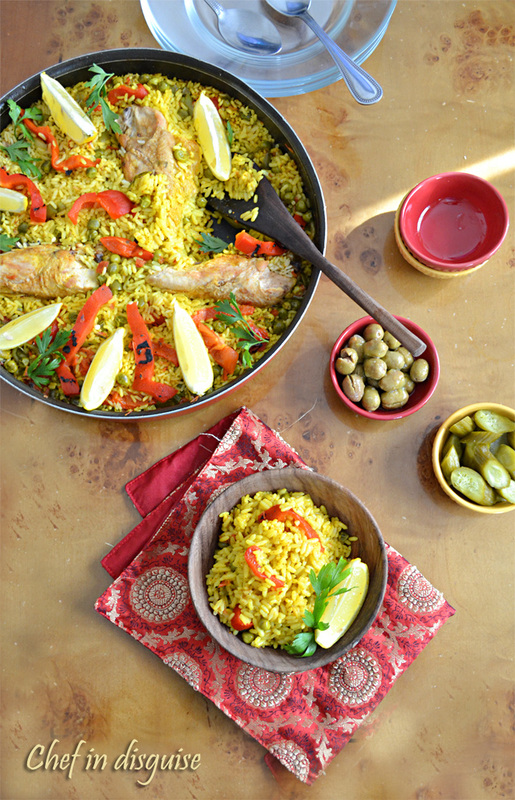 Just looking at the gorgeous pictures is making me crave for paella right now! Beautiful pictures and great job for this month’s challege! Your version is stunning! You know I bought some authentic bomba rice here in Toronto and loved it. Now I can’t remember where I got it … can you believe it? My Puerto Rican friend makes a similar rice dish in a caldero, and they all fight for the crispy bits on the bottom. Sounds like the same idea as the socarrat. Hello Barb, I sadly couldn’t find bomba rice but I have not given up on cooking yet. My husband loves those crispy bits better than the properly cooked rice! I share your trepidations, Sawsan, when it comes to making paella. It is such a wonderful dish when properly prepared and the internet is of no use when it comes to finding a recipe. “Authorities” abound and so many are in contradiction of others. You, though, seemed to find the perfect recipe. Your paella looks fantastic and if your children enjoyed leftovers the next day, it must e very good. Well done, Sawsan! Hello Sawsan, I tried the recipe, tasted really good, however I had a problem, the parboiled rice took a lot of time to get cooked as much of the broth evaporated before I put in the rice, so I had to add a lot of water later. Should I have soaked the rice in water for some time before adding it to the broth? Another question, should I cover the pan during cooking? Thank you.